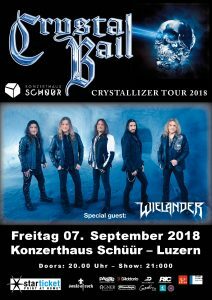 The Swiss melodic metal band CRYSTAL BALL released their new album „Crystallizer“ at Massacre Records on 27 april 2018! Order your album now! Make sure to get your own brand new limited Digipack-CD with 2 exclusive bonus tracks. With the critical acclaims for the last album «Déjà-Voodoo» (Massacre Records) still going on, the bustling Swiss melodic rocker strike again. Already with the opening titel track „Crystallizer“ they show impressive why this band belongs to the upper class of melodic metal! The new CRYSTAL BALL opus has again been produced, mixed and mastered by Stefan Kaufmann (ex-Accept, ex-U.D.O). Kaufmann is meanwhile seen as the band’s familiar sixth (studio-)member of this powerful live band. Their attitude towards a current difficult music market – with consequently ignoring short-lived trends – makes these energetic rockers even more likeable. 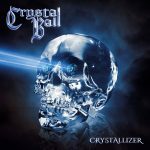 CRYSTAL BALL about the new album: „Crystallizer“ radiates a full load of melodic Hardrock/Metal! Thrashing deep beats combined with exciting melodic hook lines crystallize into cathy riffs, melodies and lyrics. And CRYSTAL BALL put their typical stamp on every one of these songs! SEE YOU ON TOUR, CRYSTALHEADS! The Band has recently entered the studio to record the newest Crystal Ball opus. As on the last records, Stefan Kaufmann (ex-Accept, ex-U.D.O.) sits in the producer-chair. The new album will feature many surprises and will be released in the summer of 2019! The Crystallizer tour continues in April/May and it will reach it’s conclusion then. Please choose your top ten CRYSTAL BALL songs from the first six albums (1999-2007)! Hit the “Abstimmen” (vote) button after you checked your 10 songs”. 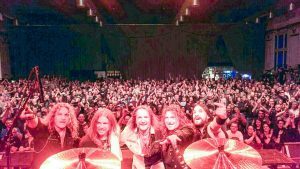 Many thanks to everybody who came to see us live on our #CRYSTALLIZER Germany-tour during the last ten days. You Rock! A big thank you to all participants, our crew and both bands Black Diamonds and Gods of Silence , as well as rockphotos.ch . On the 30th of November 2018 the tour goes on. A joint show with Coreleoni in CH-Lyss and on the 21th of December 2o18, we’ll play a special X-mas show in CH-Aarburg! Hey CRYSTALHEADS, are your ready to get CRYSTALLIZED? We’re on headliner tour in Germany from the 26th of October 2018 (check the tour dates section). We’re supported be by Gods of Silence and Black Diamonds. Don’t miss the Swiss! 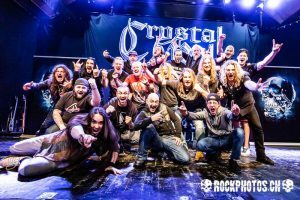 Hello you crazy CrystalHeads, we’re looking forward to the upcoming shows at Riverside Open Air (CH), the hometown show at Konzerthaus Schuur in CH-Lucerne and the Rocknight in Tennwil (CH) where we’ll meet our friends The Poodles again. Check the tour-section to finde more new dates. For instance a co-headlining show with Coreleoni and a X-Mas show at the Musigburg Aarburg. 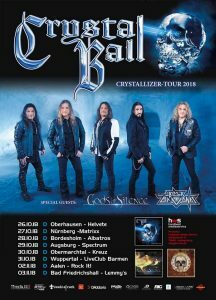 We’re happy to present you the dates for the Crystal Ball headliner tour in Germany this autumn. Mit dabei sind Gods of Silence und Black Diamonds. We have two more great Swiss bands as supports on board: Gods of Silence und Black Diamonds. Looking back at a great tour with AXEL RUDI PELL! Weplayed 11 packed shows and 6 were even sold out! We met many great people and entered the Swiss Charts at #18 and the German Charts at #61! Many thanks to all attendants and all the old and new CrystalHeads. 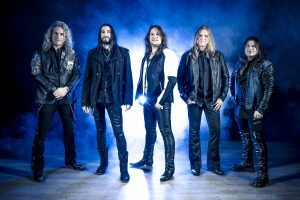 A huge thank you to Axel Rudi Pell and the whole crew! After the tour is before the tour! On the 24th of may the show goes on, CD Release show in the Kulturfabrik Kofmehl, on the 25th of may at Temus Club Lugano-Agno and on the 26th of may in the Hall of Fame, Zürich-Wetzikon. Please use the pre-sale, check the tour dates ! We’re happy to announce our chart entry in Switzerland on #18. Thanks you all honest buyers of our CRYSTALLIZER album. We entered the official German album-charts at #61! Many thanks to all honest buyers out there!